Iran has declared the successful test launch of a new ballistic missile, Khorramshahr, a few hours after it was unveiled during a military parade in Tehran. 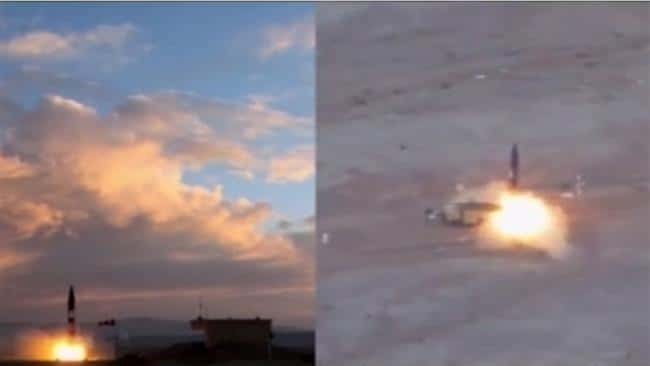 Video on the State broadcaster IRIB on Friday showed the launch of the missile from an unknown location. The Khorramshahr was displayed in a parade attended President Hassan Rouhani and senior military officials. It is Iran’s third ballistic missile type, with a declared range of 2,000 km (1,240 miles) and the capability of carrying multiple warheads. Brig. Gen. Amir Ali Hajizadeh, the commander of the Islamic Revolutionary Guards Corps’ Aerospace Force, said the Khorramshahr is smaller in size and thus more tactical than its two predecessors. Hajizadeh asserted that the missile will be operational in the near future. The test is a pointed response to US pressure, including new sanctions and Tuesday’s UN speech by Donald Trump denouncing the “corrupt dictatorship” in Tehran and threatening withdrawal from the “embarrassment” of the July 2015 nuclear deal. Trump Administration officials later said the US will not leave the agreement, but said they are seeking to extend its length and to include restrictions on Iran’s ballistic missile. Iran has repeatedly defied the Americans. The Revolutionary Guards have promised no easing of their challenge to the US, and officials such as Foreign Minister Mohammad Javad Zarif have said the missile tests do not violate a UN Security Council resolution passed at the time of the agreement. Earlier this week Revolutonary Guards commander Maj. Gen. Mohammad Ali Jafari promised “painful responses” to Trump’s speech, which declared Iran a “rogue” state and implied that the regime should be overthrown. He urged President Rouhani to respond “decisively” and the Government to “use all of its options to protect its interests”. Rouhani took a firm but less hostile line in his Wednesday address to the UN General Assembly. He condemned the “ignorant, absurd and hateful rhetoric” of Trump, but — hoping to detach other countries from the US — emphasized “moderation” in international affairs. At the same time, he made clear that Iran would not halt its missile testing as it adhered to the nuclear agreement. On Thursday the Supreme Leader said, “The American elite should be ashamed of having such a president” as he castigated Trump’s “derogative and cheap talk…filled with lies and distress”.